At times Waltham altered the jewel count on Vanguards. This was accomplished by milling out the original number that indicated the number of jewels and inserting a plug, the top of which was marked with the new jewel count. This along with the appropriate jewelling alteration allowed retrofitting a movement according to need. To date only 21 and 23 Jewel plugs have been reported. In the case of the 21 jewel plug, the examples reported so far would lead one to the conclusion that the plugged movements were originally 23 jewel movements. It would also appear that the 23 Jewel plugs were made from both 19 and 21 jewel movements. The plugs have been reported in brass, gilt, nickel and steel. Further research is needed to determine the actual materials used for the plugs. Originally it was thought that plugging was only done on other Vanguard movements and not in any other grade but after years of research, it came to light that 2 movements found in Appleton Tracy & Co runs had been plugged and converted to 21 jewel Vanguards. Hopefully the reader can get a feel for the difficulties in determining production figures for these movements by examining the tables below. First of all, we can only say with certainty that eleven 21 jewel plugged movements have been reported. Because some collectors are not aware of the plugged movements, it is possible that reports have not always included information about a plug. It may be safe to assume that any 21 jewel movements found in these runs is plugged but, who knows? The most interesting run is 12540501-12541200. 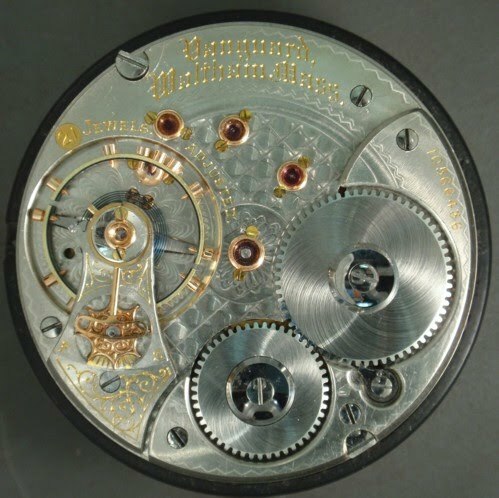 The current research would suggest that other runs contain either 21 or the 23 Jewel plugged movements. 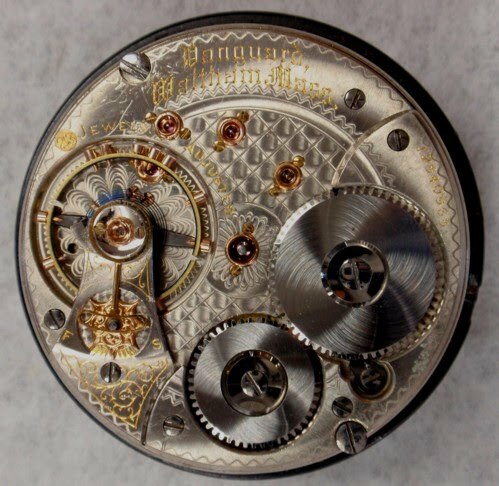 Photographs from this run show that it contains BOTH the 21 and 23 jewel plugged movements. For the record, eleven 21 jewel plugs, and thirty eight 23 jewel plugs have been reported suggesting the 21 jewel movements are more scarce. Note 1-Run 12500001-12502500 is listed in the Gray Book as a run of 21-23J hunting case movements. Both hunters and open face movements have been reported from the run and the breakdown listed here is according to the pattern into which these movements fall. Note 2-Run 12540501-12541200. There have been 2 21 Jewel plugs reported in this run. Note 3-Run 17077001-17077500. Although not indicated in the Gray Book, this run contains Wind Indicator movements. Of the 27 movements reported, 21 are Wind Indicators.